What do you see when you look at your blog posts? The same font and formatting on every post? Or are they looking real messy with a range of different fonts? Most likely you weren’t warned of the dangers of copying and pasting text written in Word into blog post! What happens is the text you paste from Word brings in lots of extra code. Normally this makes your post’s font and formatting look unattractive plus may add extra words you haven’t written. In extreme cases it can prevent your blog loading in Internet Explorer. This sentence was written in Microsoft Word then copied and pasted into a blog post. Right now looks perfectly fine. Now look what happens when I click on the HTML tab. 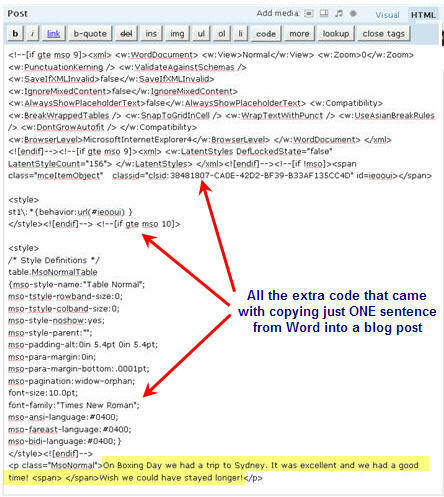 See how much code was transferred from Word by just copying and pasting one sentence. Same can happen when you copy and paste text from emails, other word processor applications, websites etc. Just paste the text into the text editor and then copy the text from the text editor and paste into your post. This strips out all code and prevents formatting problems. Please note pasting into a text editor does remove all links to websites. NOTE: There is a Paste from Word button inside your dashboard which is meant to be used for this purpose. However I’ve found it doesn’t always remove the extra code. Please remember to explain the reasons why you shouldn’t copy and paste text directly into blog posts when you are teaching others how to blog. What tip(s) do you wish someone had told you when you first started blogging? I know this post was written several years ago, but what your users fail to realize is that MSWord was set up to print documents, meaning what you are typing was intended for print. The code that is transferred is the printer code — instructions for the printer on how to print the document. It was not intended for copying and pasting into an html page. MSWord has fixed this over the years by adding non-formatting options, but you should always paste the writing into a text editor to strip code before placing it on a web page for use. Most web programs come with a CMS system that allows for a visual editor so that you write it there, instead of copying and pasting from Word. most of the times I use on page editors like HTML editor available. I think you never should use a Word-like program, they all screw up the layout. Obviously a problem with posing to blogs with word, though comments above offer solutions. Here’s MY problem. I want students to do some large projects like a long paper, powerpoint, stuff like that. I have an RSS feed on my own blog so I can track when my students post to it. Thus, potentially I can track submissions by students. Wrting a paper on a blog seems ridiculous. One reader comments about a program that probably removes code, and allows you to post. I don’t want to do anything until I get this figured out. Any suggestions. @marknair59, This latest version of WordPress that Edublogs now uses does automatically delete the bad code from Word — so that definitely has helped. In terms of your other question it really depends on what you are wanting them to do in the assignment. It may be a combination of them writing reflections on a blog and writing the final product on a wiki is the best option. However it is hard to know without more specific details in terms of what you are waiting them to write. I am new here, but I’m sure glad that this was the very first post to my blog. It actually solved a dilemna I had copying a word document into my Yola web page. Yes, it has to do with code. Computer User from the Atari and Commodore 64 days!! I just wrote a page by by selecting new page from the dashboard. I did use bullets since they’re on the toolbar. When I looked at my page the bullets were not there. I didn’t write in Word, but the pagee doesn’t look like the one I wrote from the dashboard. @Michele Can you give me the link to the page you mean so I can check it out? @grw04002 @Phil Hart @Ken Allen If @grw04002 means this blog http://mrwaldron.edublogs.org/ and the latest post on the blog – he is correct – there is definitely no extra code in his latest post. Understandably if he pasted directly from Word into the Visual Editor of a blog post he would ask why I am saying this if there is no extra code. So we have two choices 1) he is right 2) he is doing something that is removing the code. Time to test! And guess what – testing it looks like he is correct. To me it looks like with this version of WordPress MU – which is WPMU 2.8.2 it is removing the extra code. Here is my test post – Testing Word. I tried it several times and I’m not getting any code being transferred by just copy & pasting directing into the visual editor. Could some one also please test and confirm with me they are getting the same results? Interesting facts about this. WordPress MU is still including the Paste from Word button in their advanced formating toolbar. If this is correct – are they aware it is no longer needed? WordPress.com support material currently still provides exactly the same advice as me – although their support material is for an older version of WPMU. @Phil Hart, can you give me a link or title to the draft post in your dashboard so I can look at it? mmmm well the good news is now if people do copy/paste from Word into an Edublogs blog it is extremely unlikely to now cause problems in Internet Explorer. However that doesn’t apply to all blog software, and may only apply to this specific version of WordPress MU. Thoughts? @Sue Waters, http://philhart.edublogs.org/ very unpretty atm. @philhart, Thanks Phil – you can make it pretty again. There is a reason why I have numerous test blogs. I have been unable to impress on (some of) my colleagues that mutual respect and a bit of trust goes a long way in keeping relationships open sufficient to resolve problems that arise due to this. A couple of weeks back I was about to address 60 teachers and facilitate a discussion on cybersafety. I’d selected a series of videos to spark discussion. Naturally I arrived 45 minutes earlier so I could check out the equipment set up in the discussion room. I discovered that the laptop there would not play any of my vids. When I asked for assistance I was regarded as someone who really didn’t know how to use the equipment for all the laptops were set up the same way including the one set up in the discussion room – and I should have known that. A quick check by an irritated IT manager confirmed that I was right. The problem was quickly resolved thereafter. The issue I bring here is that we need to think in terms of communication and possibilities as well as respect our fellows. Not everyone is using the same equipment/version/type of software. Not everyone uses these the same way either. Nothing new here. To argue that I am wrong when I say, “this is what I’ve found when I did it”, is as helpful as arguing about the right to have an opinion in the first place. Perhaps we should be more inquisitive when someone finds something different from ourselves. Glad we’re closer to resolving something here! And good on you Sue for being persistent – the hallmark of a true scientist! @grw04002 @Phil Hart @Ken Allen I learnt a long time ago with blogs if someone says or implies opposite of what you thought was true to never discount. Always investigate! Because more often than not — they aren’t wrong and further investigation was definitely needed. So thanks @grw04002 for bringing it to our attention…and based on this what advice would/should I give others re-Word — no idea 🙁 Still pondering. @Sue Waters – I don’t know if there is a ‘help’ here. But many decades ago, when I was drafting research reports and a thesis, my good supervisor, Ted, was always ready with advice. He didn’t criticise, but proffered ideas and suggestions. One of his best was in the use of language in scientific reports – I think his advice could also help in reporting on blogs. Ted explained that if a finding seemed to lead to a conclusion, rather than state that conclusion it was better to say, “it suggests that . . .”. If an observation tended to refute a claim, rather than say the claim was in error it was better to say, “the observations did not support the claim”. If almost unequivocal evidence was amassed refuting a claim, it was collegial to suggest that a closer look at the evidence was in order but to admit that there was still margin for more observation to be made. Tenei to mihi ki a koutou! I have to admit that having followed this discussion since January (!) and contributed to it, that there seems to be no resolution forthcoming. We all seem to have our own beliefs. Clearly there is a disparity between some of what’s being reported here. Those who support the direct pasting from Word seem just as resolute in their belief as those who do not. It cannot be a factor of how one holds one’s mouth at the time, geographic location or belief held. Surely there must be a simple (dare I say Scientific) way of showing whether or not rogue html is lifted from Word with the text when it is copied! It should be as easy to show if the html, if present, is deposited with the text when it is pasted. Yep the MS Office application copy&paste thing is a real nuisance. The best solution for it is a little freeware utility called PureText. It strips out all formatting and just leaves plain text. Instead of “ctrl+v”, I now simply “windows+v”. It’s virtually an unconscious action now. I tell you what the biggest problem is, it is when you switch from the visual editor to html then post something, I have lost count of the times people have done that and not checked their posts. If you like writing your blog posts in Word, why not just hit ‘save as…’ and save as a text file? Saves the additional step of copy + pasting into a new text editor. Alternatively, you can also highlight and copy everything you’ve written in Word, and then select Edit >> Paste Special… >> Unformatted text. One last way to do this is also to view your formatting palette, highlight everything you’ve written and hit ‘clear formatting’. Hi James, I do understand why users often write in Word. Often it is a case that no one has ever told them the issues or what can happen if they paste straight from Word into a blog post. Some it has to do with access to the Internet, wanting students to have access to grammar and spell checker. Others try and use Word to create tables etc that then work in their blog posts. In most cases it is simpler, and safer for me to say, don’t copy/paste from Word then talk about the other options which can then confuse them — our users range in age from 6 years upwards. It becomes a huge issue when you have a user that has been doing it for a really long time. Going through all the posts to work out which post in particular is causing the problems isn’t a lot of fun. I don’t agree. Word is a great. Maybe if this site had word processing, I would just use it. Since it doesn’t I have to resort to using Word, a program I like. I’d rather have tons of html and have it be grammatically correct than use this and have there be tons of mistakes. Hmmm. This does rather make the assumption that the grammar checker and spell checker in Word actually work. I have long since forgotten how many times I have had to over-ride those two checkers. Sure Word is great for spell checking – just make sure you put it through NotePad to remove the code. Remember that some of the code it brings in can totally cause Internet Explorer to lock up which means that it doesn’t matter how well you have written your post – many of your readers won’t be able to read. How i can i delete my account in this annoying website!!!!!!!!!!!!!!!!!!!!!!!!!!!!!! I write my posts in word (for the spell checker and grammer checker), but I always copy and paste to notepad before copy and pasteing to my blogs. Good point about the grammar check. I use FireFox that automatically spell checks but doesn’t do a grammar check. how do i do that????? Hi Gail – I use cutepdf also – great program. Must check out your site to see what the newsletters look like. I think it was dogtrax who recommended I turn my Word docs into pdf. I downloaded http://www.cutepdf.com/ , the free version. I write the doc, select file – print – then choose Cutepdf as the printer option. It doesn’t print the doc, just saves it to My Documents with a Microsoft pdf file name. When I want to post it, I upload it as an image and choose the pdf version from my doc file. I love the program for a couple of reasons. The biggest one being that it is a smaller file added to my Edublog account. The other was my docs look the way they are created. Of course the product is a link and not an embedded doc. I create a newsletter each week that I want posted to my blog. I can’t get that accomplished with copy pasting Word doc as is. This is my first time on this program/site. It’s great to have so many tips!! Hi Wendy – glad you have found it helpful. Don’t forget to grab the manuals on Getting Started with Edublogs. There’s always the option of using the “remove formatting” tab, isn’t there? Haven’t looked at the code, but for me it works to standardise the font so it at least looks the same. True Linda – you could try changing the font appear to look the same. But remember worst case scenario is I have had to fix up blogs that won’t load in Internet Explorer due to bad code from Word. Thanks to everyone’s contribution. I had a situation where I wanted to transfer a Word doc into a blog. The original doc was on a template and even though WordPress has the option to upload a Word doc, it didn’t like the template and threw things out of wack. It was very frustrating trying to fix it up and seemed to defy me as it would revert back. Next I tried a table (in Word first) it imported the table ok but I didn’t want all the table lines showing. I guess I will need to create the look I want in html? Any other options? PS I love the new look! Hi Marie, my solution when I need the look of a table is to create it in Word than take a screenshot of the table and insert as an image. Now I’m sure that the web design people who have responded in comments here will come back and explain why inserting tables using HTML into blog posts isn’t a good idea. I don’t like using screenshots for tables: the resultuing images have blurry edges to my eyes: I prefer to see letters within the table having crisp edges. and then turn make them white font. That did the trick! This post seems to be generating a lot of discussion! I now present a controversial opinion. The web was first conceived as a vehicle for exchanging content. I maintain that the web had, and Web 2 still has, this as its FIRST priority. Then computers became more powerful, and so presentation was possible as a second priority – we got fancy with colours and layouts, particularly with the use of <table> tags (and I had to use my knowledge of how this web server works to get that to display properly). Then WYSIWYG editors came in, (with Microsoft Word as a Johnny-come-lately), with all the extraneous tags (clutter) that they throw in just for the sake of it. has this affected content? NO! has this affected presentation? Yes, so you need to know what you are doing if you are going to use anything other than pure HTML coupled with a knowledge of how the relevent web server works – this is consistent with Sue original (and honourable) post on the matter. Can we avoid clutter? Generally not – go to your favourite home page, view the source, and you may be astounded at the amount of clutter that you see. When I first created my blog, I didn’t even realise that you couldn’t view it in Internet Explorer for months and months. That extra text from Word was really messing things up. I still write in Word though, as I find it the most comfortable. Just when I paste it into the text editor in wordpress, I manually switch it over to html view, and delete that big chunk of code at the start. Normally Anna the main thing I observed is problems with Font – seems that issues with Internet Explorer as less common. Worth trying the Notepad method as it works really well. I have had the best luck drafting in either Google Notebook or ScribeFire. Then I will post to my blog. From ScribeFire, you can post into most blogs directly without copying and pasting. Hi Dave, thanks for telling us about Google Notebook and ScribeFire as I wasn’t tested either. Having the mobile computer lab in class once a week means we type some posts on the class computer’s Word program. Thanks for the tip about pasting Word text into the text editor and copying from there. It will help. I rather enjoy the somewhat archaic act of hand coding HTML to spiff up a blog post. I’m more concerned with spelling correctly – so I use ieSpell, which is freeware. I can go with Alix’s comments about HTML. I also throw in the odd bit of CSS for colour, but I have to look bits of it up sometimes. I cheat on the HTML – I literally have a “cheat sheet” of my most commonly used coding. Wow! There’s a lot of opinion here. Isn’t that great? I have always used Word, but was quick to find the problems you mention with what I call the junk being carried across. The ouchy thing about this junk is that some versions of some browsers don’t show it up and other browsers actually display the html on the screen, would you believe. It was very disheartening to see one of my posts in another browser, when it looked perfectly good in Firefox. At the same time, it was a good lesson and an early warning. I have to say that I very quickly adopted the practice of pasting into Notepad and then lifting the text from Notepad into Dashboard. I do ALL my format in Dashboard – font, colour, size, alignment, bulleting, indents – including putting in the links to sites. Why do I continue to compose posts in Word? Composing in Word is convenient. I can compose without logging on to the Internet. I can save a draft and I don’t have to log on to the Internet to work on it at a later time. If the site goes down, or the Internet has a poblem (for whatever reason) I can still work on the draft. I also use many of the features in Word that are absent or less rigorous in Dashboard. One feature I use a lot is the Flesch Reading Ease. That’s not available in Dashboard. If I composed in Dashboard, I’d have to copy the text into Word or other application to use Flesch, and then copy it back again, which defeats the purpose of composing in Dashboard. I think you were right to provide the advice about the use of Notepad. The only warning I’d give a new blogger who chose to compose in Word is to be specially careful not to copy direct from Word. Yes Ken I’ve noticed a few people are using Flesch Reading Ease. While the concept is interesting I like to base mine on a mixture of checking its readability and then reflecting on how it looks visually to read online. You do exactly what I do – that is check for readability AND how it looks visually on line. I do this after I’ve written the draft. ‘Flesch’ is a tool. With all tools I use, I am the master (not the expert 😉 ). The reason I have my students type in word first is to correct simple grammar mistakes they let slide by. They know they are being graded on their posts so their grammar counts. I will have them type in word first, copy and paste to word pad, and then copy and paste to the blog window. Very valid point Ms Britt and Ines about grammar check – I use FireFox which has spell check and get frustrated when using Internet Explorer because it doesn’t. Some of my young students write their posts directly in word because they need the help of the spelling corrector for Portuguese. Then, often, the font size of their posts gets too small. In this case, I just go and re-write the whole post directly in the dashboard. From now on, I’ll try to copy and paste their texts in to note pad so that they will lose the formatting code, before copying them and pasting them again in our blog. Thanks everyone and all very valid points about writing the text using an offline method. With the autosaving feature of WordPress losing posts is now less of an issue; but writing any document online is always a risk. @Gary That sentence I wrote to demonstrate when copied into Paste from Word still brings in code. In the WordPress.com forum they also recommend not using it. @Christophe OpenOffice imports quite a bit of code also – unfortunately. @Gabriela You can also switch to full screen mode in your blog dashboard if you want the writing area bigger or expand it by drop and dragging it. Trouble is users often write their documents in Word then copy directly into posts without understanding the consequences. Writing using applications like Windows Live Writer is definitely a good option – I used to use this application myself. Use word with NO formatting, on the clear format style. this way its all defaults. don’t style anything, just brain dump in word. Do all the styling in WP. I use Windows Live Writer . Works great. It connects with my blog and aligns fonts, has a publishing calendar, text editor, and other user-friendly features. I only found out about it after doing just what you talked about–cutting and pasting from Word–and my first few blog posts were all askew–fonts, alignment, etc.. uhggg! I contacted Typepad support and they recommended the app. Haven’t looked back. I’ve had great success with Windows Live Writer from home, but our computers are totally locked down at school so I can’t install it there. I may try the Google Docs option Gabriella mentioned. You know that you can take the post area to full screen mode? You click on the Toogle fullscreen mode button which is next to the kitchen sink button at the top of your write area in your blog dashboard. I cannot write directly in the blog editor. I need bigger spaces. So I use google docs and post directly from there to the blog. Share>Publish as webpage>Post to blog. Thanks for this handy tip! Thanks. And MS Word DOES make a mess of code anywhere it is copy and pasted. So very frustrating to fix. Tell me about it Ms Edwards – as I’m often the person who has to help fix up blogs broken by people copy and pasting from Word into blog posts. Word doesn’t even play nice with its own web editor, FrontPage. Hmmm. Gabriella: I’m just getting started with wikis and blogs. I want to have my kids post word documents as homework, rather than turn in paper. I read most of the comments about using word, but your use of google docs sounded interesting. If you were going to have kids create lengthy papers, how would you have them turn them in? On google docs? On a wiki? Posting word docs to a blog doesn’t sound like it works. Anyone else want to comment. I’m new, and need help. Did you tried with OpenOffice ? I type my posts directly into the ‘new post’ box, using the html setting. Even using the visual setting when posting can sometimes result in strange happenings! Firefox spellchecks as I go and I preview before I publish. Very simple. I tend to agree with Gary re needing somewhere to write yr text and notepad imho is crap for enabling a good flow of thought to keyboard. Suspect it depends on how “clean” yr Word. I do no formatting from my default Normal (which is Arial as I hate TNR) except paras so the extra html on mine tends to be limited – and yes I do a “dirty” copy and paste not using the Word option. any other formatting is done in the dashboard. I do check it looks OK and I wld NEVER use the save as html option in Word as this adds masses of junk. If it doesn’t look OK (this hasn’t yet happenned) then I check the html. Otherwise can’t see it really matters if someone chooses to look at html and sees the small amount of junk – unless Im looking for a job directly scripting in html rather than using an editor (they all in my exp add some junk – even my favourite Nvu). The notepad/textedit solution will work for plain text. The use of lists, images and hyperlinks requires a little more learning on the part of the learner. I would issue health warnings for every other visual editor, specifically including DreamWeaver, MS Word, OpenOffice and Nvu. The bulk of most blog posts is text – Right. You just need somewhere to write the text that is not going to disconnect, scramble the text on a save, or crash the browser. You just need somewhere stable. This is why I use Word. If you just use word as a text writing platform, and don’t format the text beyond the default font, then you will be fine. It will cut and paste via the word button just fine. You just have to ensure that you do the formating you require (bullet lists etc) in wordpress. Also you can also post into the “html” mode and this will paste the text without any of the fancy code. You can then drop back to “visual” mode and you can format the post. It’s not Word’s fault that edublogs doesn’t cope! Word is widely accepted as the standard for word processing, and gives us an option of where we can write our blogs without having to worry about server disconnects, random crashes and garbled text! Perhaps someone needs to update the wordpress code so that it can deal with the widely accepted (albeit cluncky and overly coded with html) Word format rather than merely complaining about Word’s sloppiness! I have not experienced any problems cutting and pasting unformatted text although I have seen examples of mess on screen in formatted text. There are plenty of options to get around these problems. Gary I will try your trick of pasting directly into the html view on wordpress so I can be sure of what’s going on! And people, just be thankful that we don’t have to deal with the nightmares of writing in raw html anymore! But it would be my fault if I didn’t warn users of the potential dangers of copy/pasting directly from Word or any other application into the blog write area when I know how big a problem this can be (since I have to fix blogs broken this way). If you did the same in almost any website, not just WordPress powered blogs, you face the same problem. WordPress has tried to overcome it by adding the Paste from Word button but it doesn’t strip out all the code so can still cause issues. @Sue Waters, I just wrote an entire blog post in Word and copied it. NO coding was transferred from Word to Edublogs. I’m not sure what you’re getting at in the above post, but it clearly didn’t happen to me just now. @philhart, I did literally nothing. Typed it in the newest version of Word for Mac and pasted to edublogs. Clicked HTML to see coding… lo and behold, no coding! I have looked into this issue previously. As far as I can tell, it is MS-Word expecting a lot of style information to be present in the document, which style information is not included in the copy-and-paste. Copy-and-paste from one word document to another carries that style information, but from word into other applications (such as NotePad) that style information is not received by the target, nor by WordPress. If whoever is copying-and-pasting wants the MS-Word formatting to be included on their post/comment, I see it as their responsibility to provide WordPress with the appropriate style information, but given that the style sheets of edublogs is already well thought out, I would not recommend that unless you really know what you are doing. FYI: I have given up using any form of WYSIWYG editor altogether – they are just too much trouble to get good code. I now just write in plain old HTML and inline CSS.